Correcting "Earl and Hilda Brinkman Foundation"
How do you write an inspiration piece when you are not feeling very inspirational? How do you keep going when all you want to do is give up? How do you not crawl into a ball and say "I’ve had enough?" How do you say no to that first drink, so you don’t end up at the bottom of a bottle? Not the easiest of questions, but not the easiest time of the year for me either. This time of year is dark. 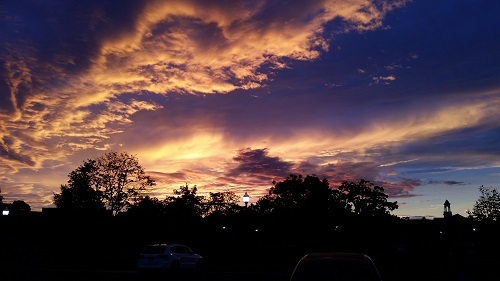 It's dark first thing in the morning and dark in the early evening. It's dark, sad and not very motivational. I miss summer already and it’s only been a week. So what do you do when it gets to you? You fake it until you make it! You power on through. You dig deep and find out what it is you are made of. I added a master swim class, I signed up for a Turkey trot. I show up and I keep doing. The only thing that keeps the crazy away for me is exercise, so when the sadness shows up, I jump in. I walk further or run faster. I pedal harder or swim a longer distance. I don’t like to be sad. I don’t crave conflict or drama. I just want to love and be loved for all it is worth. The tears come and go still on a regular basis. I don’t think that will ever end. Grief is an ongoing process and, just when you think you have a handle on it, it whips you around in another direction. The ups and downs are relentless, the way life has a way of moving on with or without you while the only thing you can do is hold on tight to your faith. This Sunday, CMAK will be holding our 2016 B2B Challenge Finale event as part of the Bikes for Kids 1st Annual Charity Ride. 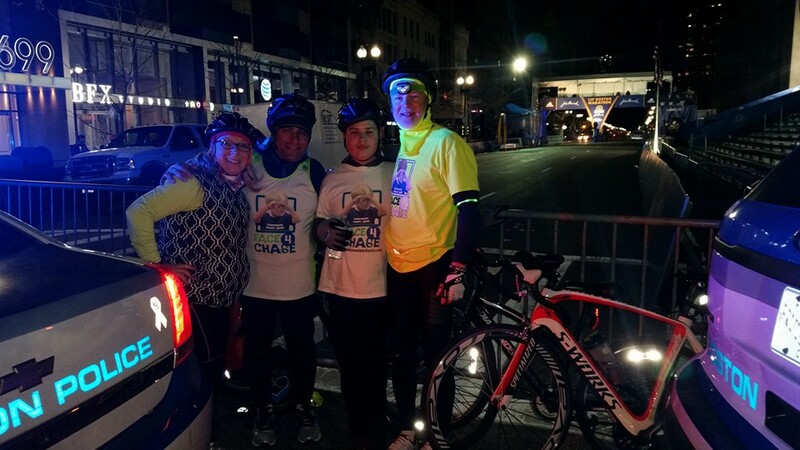 The ride will take place on October 2nd, 2016 at 7am from Old Saybrook Middle School in Old Saybrook, CT. 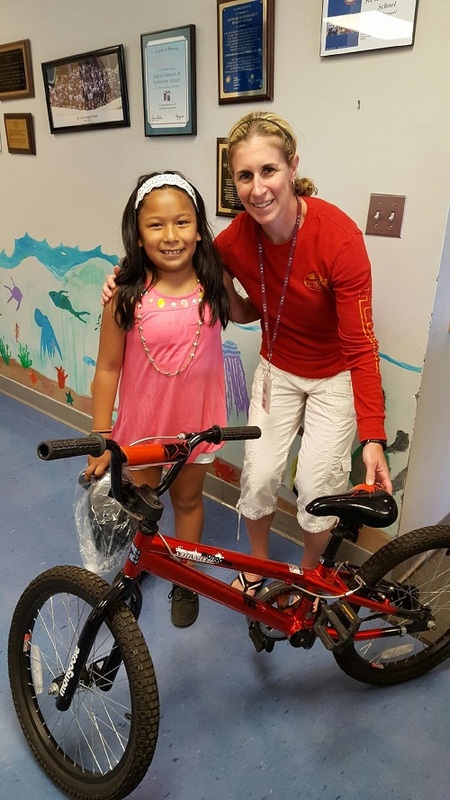 This event is a fundraiser for Bikes for Kids who provide all the bicycles for the Race4Chase Kids Triathlon Programs including providing bicycles to any child in the program that does not have one to take home after the program is over. The event consists of three cycling distances (5 miles, 27 miles and 63 miles) so there should be something for everyone. On conclusion of the cycling, there will be some special awards for those that have completed the B2B Challenge (ie finishing 1100 miles of cycling or swimming/running equivalent). 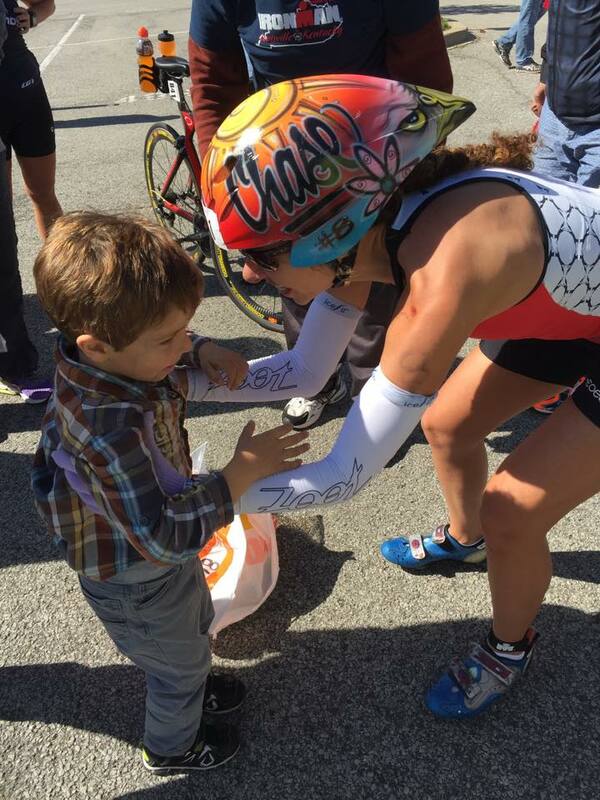 We encourage all CMAK supporters to participate in this event which supports the Bikes for Kids effort that is so important for the expansion of the Race4Chase Kids Triathlon Program. Please register for the event at Bikes for Kids Charity Ride under the Team Race4Chase. 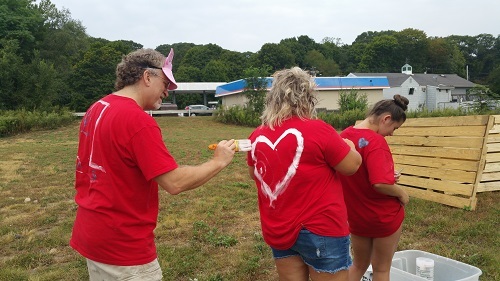 "One for all (the) ages"
CMAK has been blessed to provide an opportunity for our supporters and their families to enjoy an exciting and fun filled event in the form of a scavenger hunt through towns in Fairfield County. 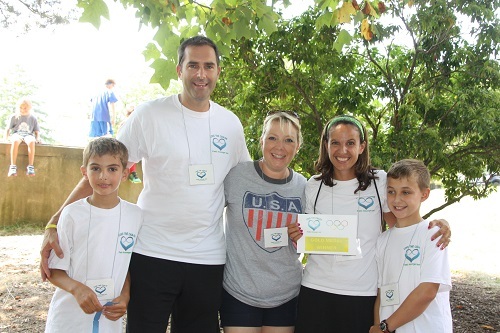 Another fun day at the 3rd Annual "Love the Chase" Scavenger Hunt. We started the day at the Discovery Museum in Bridgeport where we made cupcakes finding ingredients throughout the museum. 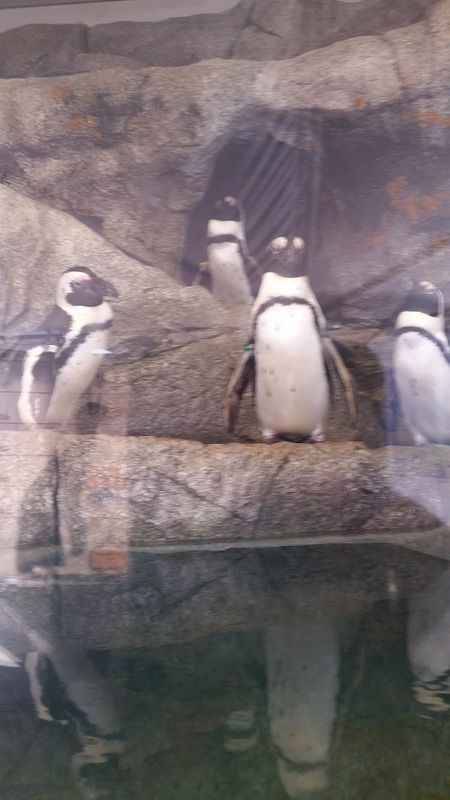 2nd stop was Beardsley Zoo and the penguin exhibit where we had to walk an egg back to the entrance using our feet, then to the YMCA for a science experiment and the Barnum museum where one teammate had to put on an elephant trunk (long stocking filled with a tennis ball) and knock over sand filled bottles with the trunk. Then, it was onto Bass Pro Shops where fisherman, Nicholas, cast his fishing pole into the bucket on the first try and to a pond in Stratford where Ben drove a toy boat around a buoy, to a train museum to hunt for a specific item within their massive train display, to a pottery place to guide a blindfolded team member through painting a piece of wood, to the Shelton farmer's market to search for items of every color in the rainbow, to a dentist's office to eat an Oreo by getting it from your forehead to your mouth just by moving your face, then back to the Adventure course at the museum to climb a tree and get a bell (we were too late to participate in this last activity much to Ben's disappointment), finally back into the museum to claim our now cooked cupcakes and to turn in our passport and bonus points and get our official finish time. 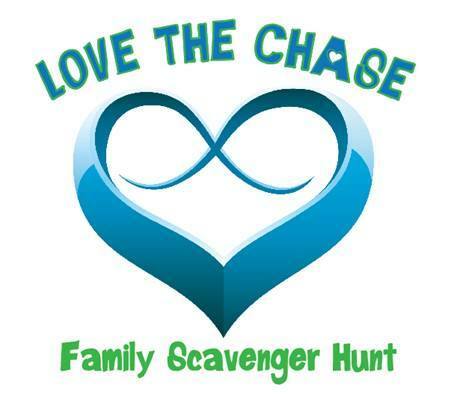 Once again, the "Love the Chase" Family Scavenger Hunt was a huge success and a load of fun for all that attended. 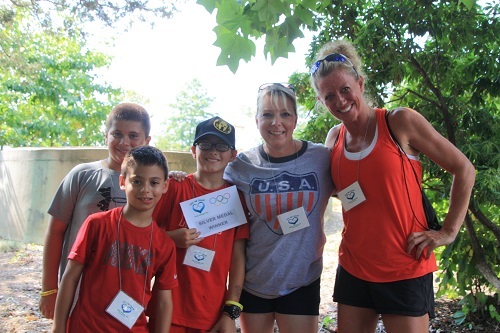 Twenty-four teams all together in the Olympic spirit, wearing their countries with pride, gathered for a fun filled day. Team Kowalski decked out in Team U.S.A. Chasing Glory colors had a car full of excited team members. 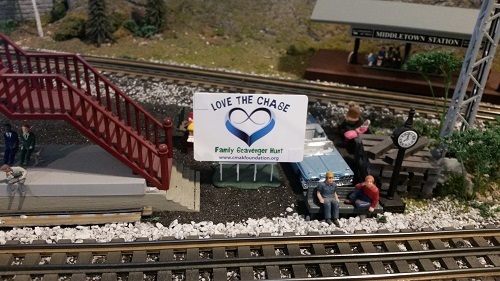 The scavenger hunt took us to many fun locations like the Booth Memorial Park train museum where we found a Love the Chase bill board by the train tracks and, for extra credit, one of the old toll booths. Stephen was the captain of our vessel as he navigated it around the buoy and back. Next stop was the Beardsley Zoo and a visit with the penguins and a walk back to the front gates like a penguin with an egg. On to the Bridgeport YMCA for a science experiment mixed with green and red. On to the P.T. Barnum museum for a little elephant games, Anthony was a little slow but got the job done. Off to the Bass Pro Shop where we did a little fishing and got it in the bucket for our next clue. It was up, up and away when we got back to the discovery museum and I clawed my way to the top of the trees to ring an angel's bell for our next clue. We jumped into the car and were off to Dental Associates for a little Oreo cookie on the forehead game. Dawn was our big winner as she wiggled that cookie into her mouth like a pro, Erin’s future was set as she got to brush Dawn's dirty teeth and made them sparkling clean with a good brushing. Our last stop had closed up shop but we were able to give a hi five and a big thank you for being part of this awesome day. We chowed down on the circus peanuts as we headed back to the Discovery Museum laughing and singing all the way. Some of the secret parts of the scavenger hunt is how Michele weaves in Chase and our family's memories. Here are a few examples. The baking of the cupcakes was a celebration of my mother's life through her love of baking. The circus peanuts were a celebration of my father’s life as he would put stale cp’s in the microwave for the kids and watch them blow up and get soft again. Chase won $2.00 for naming a peep at our Easter celebration so $2.00 were given to each team to donate at any of the stops. The Goofy caboose was a toy train caboose Chase played with on his last Thanksgiving Day. The day was filled with kings and queens, fun and love and so many smiles. All of the winners donated their winnings back to the Foundation. What an amazing group of people! To all our volunteers, Bless You, Love the Chase would not exist without you! Special thanks to Simione Health Care Systems, our GOLD Sponsor! 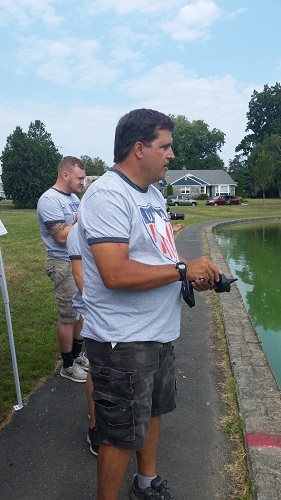 Gratitude to our challenge location stops : Discovery Museum, Adventure Park, Beardsley Zoo, YMCA of Bridgeport, Barnum Museum, Bass Pro, Giggling Pig of Shelton, Shelton Farmers Market, Dental Associates of CT- Shelton office, Town of Stratford, Boothe Memorial Railway Society Train Museum. Please be sure to frequent these businesses again, we hope we were able to give you a glance of what is available and the fun your family can have at any one of these special places. Product donations came from Dannon YoCrunch, Subway World Headquarters, Discovery Museum, Hobbytown of Fairfield, Everwonder Children's Museum, Waters Edge Resort & Spa, and Where Angels Play Foundation. 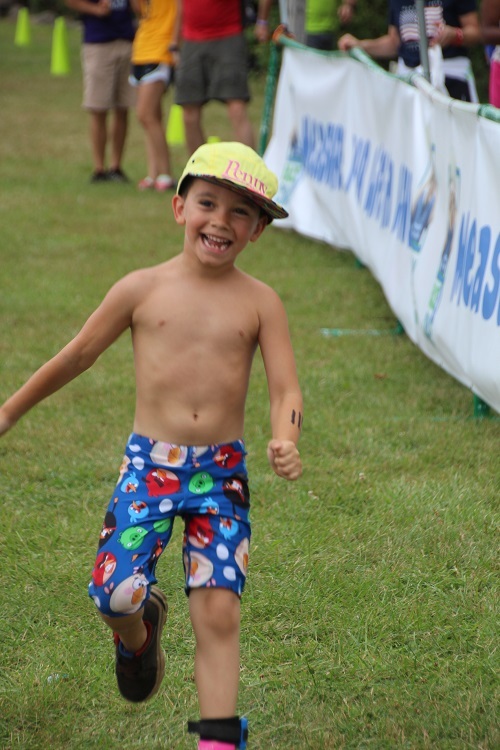 The Race4CHase Kids Triathlon Program is accepting applications for 2017 Program sites as of October 1st, 2016. The applications are due no later than November 15th with prospective sites receiving answers on their applications by mid December. 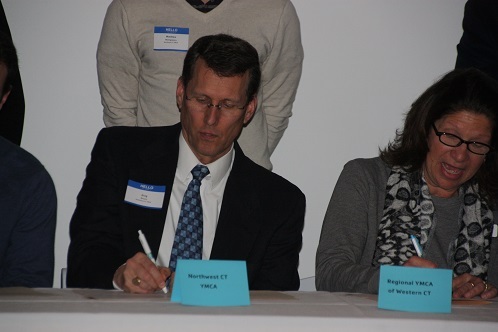 A signing ceremony will be planned for late January to officially welcome the 2017 sites. 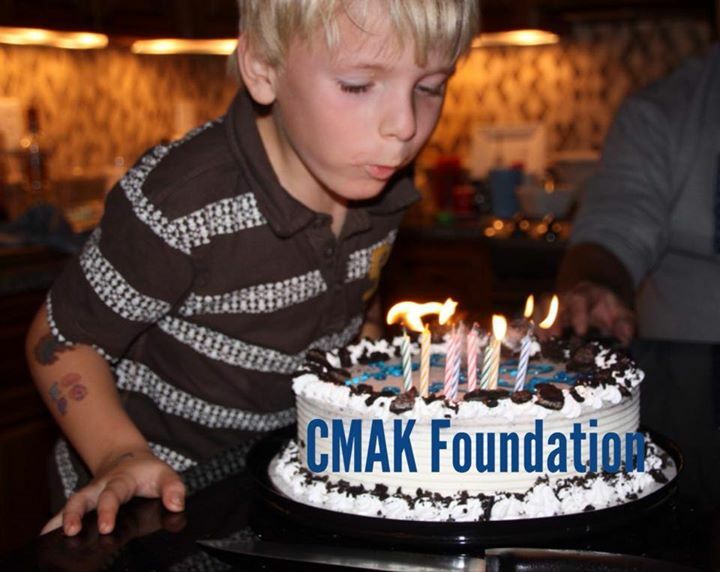 The CMAK Foundation is hoping to continue to provide grants to the current 15 programs from 2016 and expand further including additional sites outside of CT. 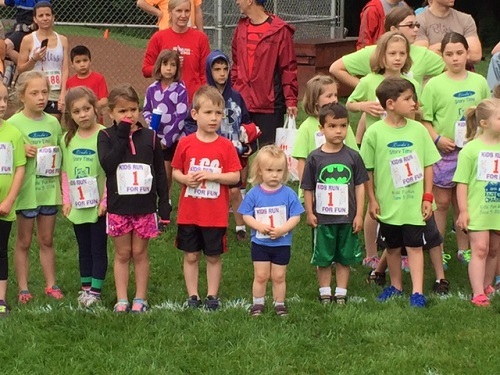 The Sprint for Monroe race committee recently made a donation to the CMAK Foundation of $4,800 as proceeds raised from the running of the Sprint for Monroe and the Race4Chase Storytime Kids Fun Run. We thank the race committee, the town of Monroe and the race sponsors including the Kimball Group for their continued support and look forward to another excellent event in 2018. 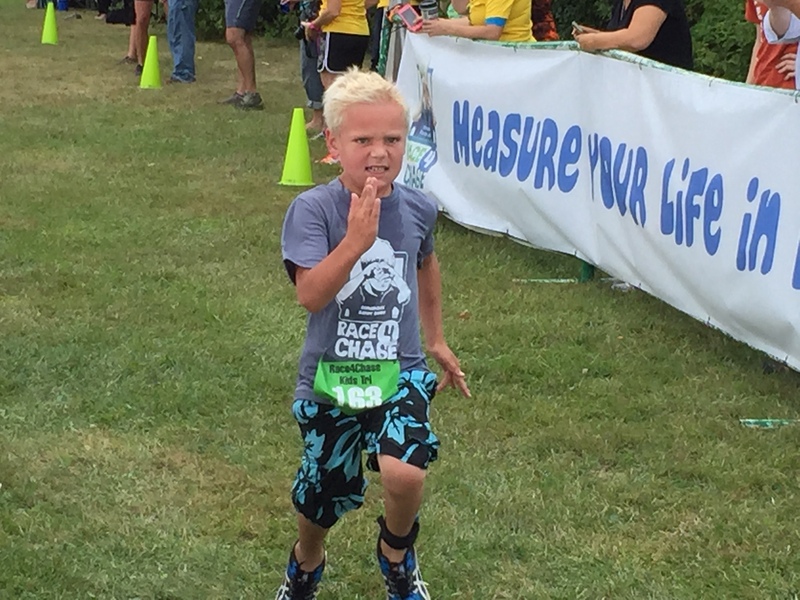 Moved by the strength of the Kowalski family and the success of the Race4Chase Kids Triathlon program and its impact on youth and their families. the Earl and Hilda Brinkman Foundation presented a check of $2,000 to Rebecca Kowalski in support of the CMAK Foundation and the future expansion of the Race4Chase Kids Triathlon Program. Above, Danielle Noel Hawthorne, on behalf of the Earl and Hilda Brinkman Family Foundation, presents the funds to Rebecca Kowalski in an emotional show of support for her inspirational mission. 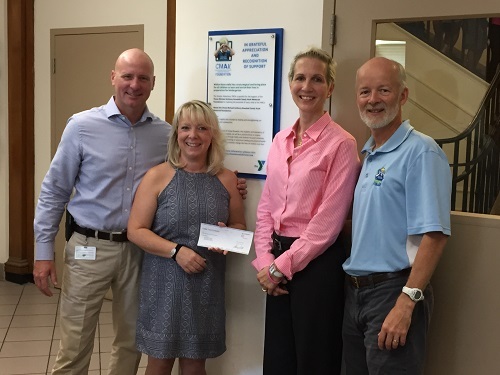 Jim O'Rourke (left), CEO of the Greater Waterbury YMCA and administrator of the Race4Chase Kids Triathlon program and Kevin Grimes (right), Executive Director of CMAK Foundation witnessed the presentation at the Greater Waterbury YMCA preschool lobby on September 9th, 2016. CMAK wants to extend our gratitude to the Earl and Hilda Brinkman Foundation for their support enabling CMAK to pursue its mission! Join us to enjoy some Indian summer ice cream at the Race4Chase Scoop Night. 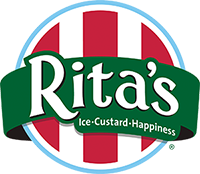 A portion of the proceeds from ice cream sales will be donated to CMAK to help support the Race4Chase Kids Triathlon Programs. Lord and Taylor Certificates (see below) will be available for purchase at Rita's during Race4Chase Scoop Night! 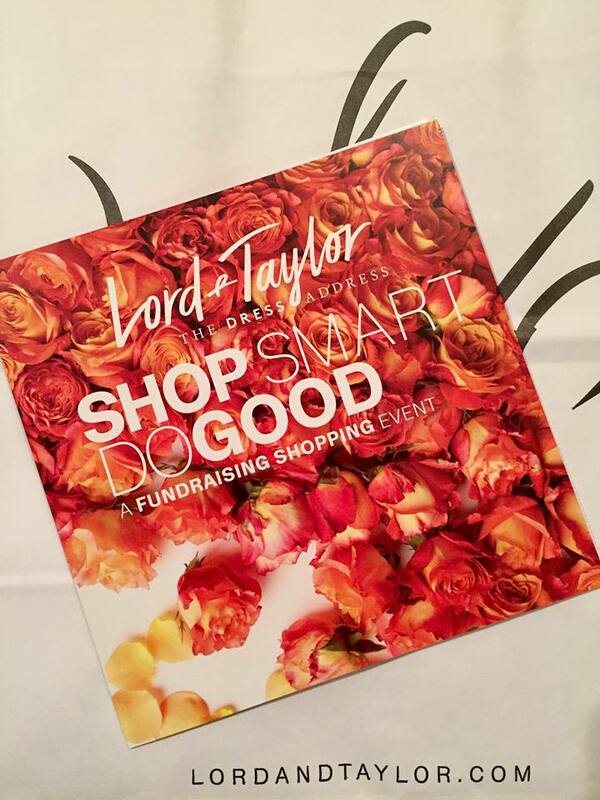 CMAK is participating in the Lord & Taylor Charity Day on October 29 at the Trumbull location. We are selling discount coupons for $5.00 each. All proceeds will go directly to the CMAK Foundation. October 29 ONLY TRUMBULL location ONLY. If you are interested, please email us at: info@cmakfoundation.org. 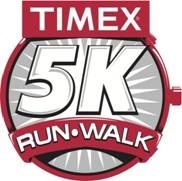 The TIMEX Community 5k attracted the largest field in its history as it once again was dedicated to the support of CMAK and the Race4Chase Kids Triathlon Program. 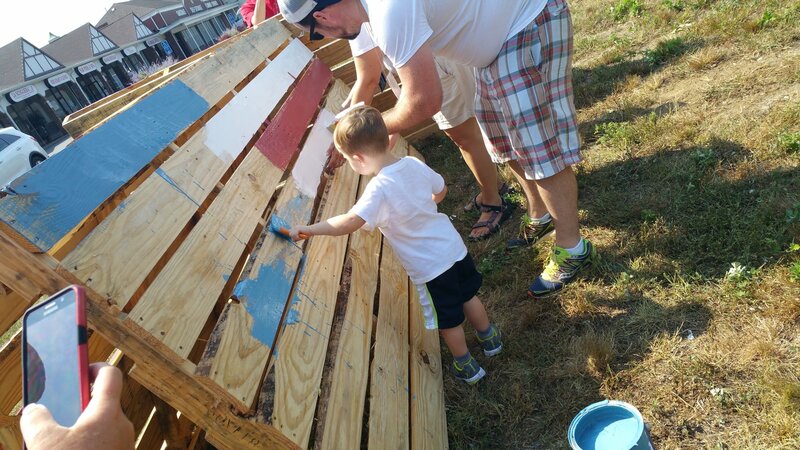 A number of Race4Chase supporters were on hand to participate alongside TIMEX employees and their families on September 2nd, 2016. 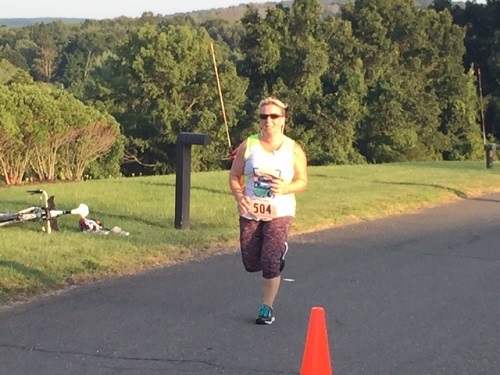 Rebecca Kowalski had an impressive performance, just missing a 5k PR, in a tuneup for the Iron Girl Triathlon in Sandy Hook NJ that weekend. 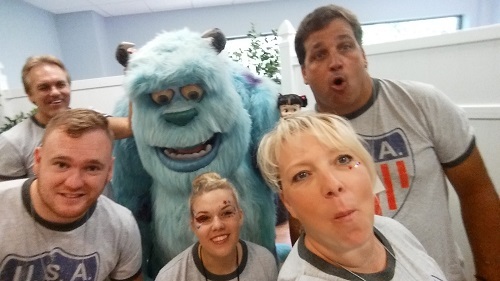 Katie Blake and family also joined in on the fun. I was surfing the internet on a cold winter evening and was looking into what an "Iron Man" was. There have been many people that have decided to become “Iron Men“ for Chase so I wanted to see what it took to become an Iron Man. Well, let’s just say, I was blown away. 2.4 miles swimming, followed by 112 miles cycling and then a marathon run of 26.2 miles. I wouldn’t mind tackling the swim and the bike, but I am lost to attempt that distance of a run. My dreams of becoming an “Iron mom” for Chase, well, let’s just say, I don’t think so. 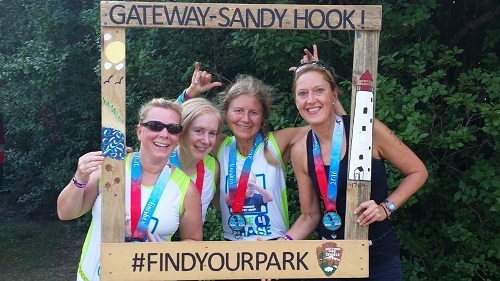 Then, I see the “Iron Girl” triathlon in Sandy Hook, NJ. I say to myself, "well, Chase momma may not ever be an Ironman, but I sure as heck can be an Iron girl. I signed up that night. With plenty of time to train, I had my summer goal set. What I didn’t know was that the Iron Girl would be my third triathlon this year. 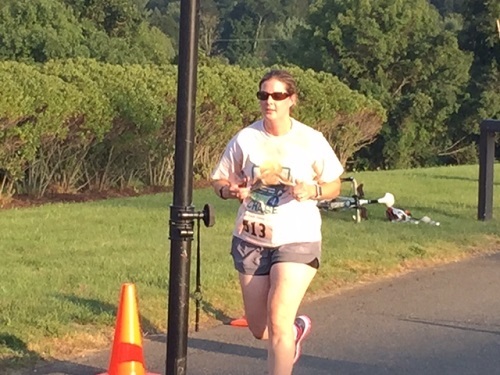 For the first time ever attempting a triathlon, I was not scared. I was ready to do this. 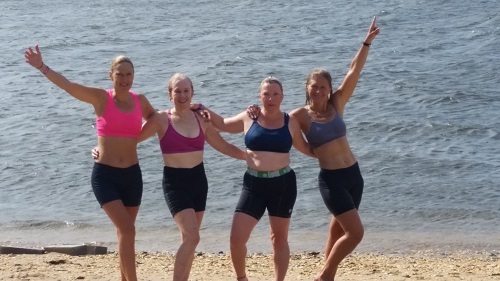 I had trained hard, I had gotten strong and I had three of the best Triathlon girls with me. How could anything go wrong? We stayed at a beautiful condo, thanks to my Angles Army friends, Karen and Joe Burke. We headed down to NJ after the Love the Chase Family Scavenger Hunt. 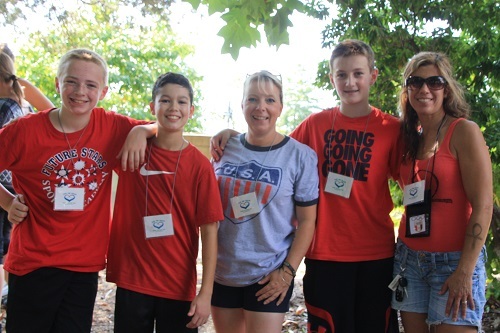 We pulled into the school parking lot, grabbed our bibs, got some bling and t-shirts and got settled at the condo. Susanne Navas and Christine Ganja woke up super triathlete style at 4:30am, so we could all get ready and set up our areas in transition. The sun rose to a windy day. The water was choppy. but it was only a third of a mile swim, 15 mile bike ride and the torture of a 5k at the end. I was looking forward to the day. Stephen helped all four of us with our gear and we were just waiting on the event coordinators to make the final decision on the swim. The safety boats were not able to stay clear the rocks. An undercurrent made the water unsafe. My Iron Girl just got ugly! The swim was called off and the triathlon was changed to a Run-Bike-Run event. If you were not comfortable with the run bike run, you could have taken the option to just bike and run. Wahoo, that’s what I would do. Until I came to my senses and realized that today the Iron Girl was a Run-Bike-Run event and, if I wanted to be an Iron Girl, I would have to do it their way. Otherwise, I was just cheating myself. I am proud to say that I finished! It wasn’t pretty. It was hard. I cried when I finished, but I set out to do something and I did it!! I cried for that, an "I am proud of me moment", such an amazing feeling. 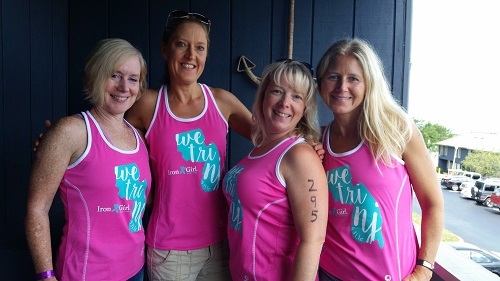 I thank my friends, Betsy Daniels, Susanne Navas, and Christine Ganja, for joining me in my first Iron Girl event. 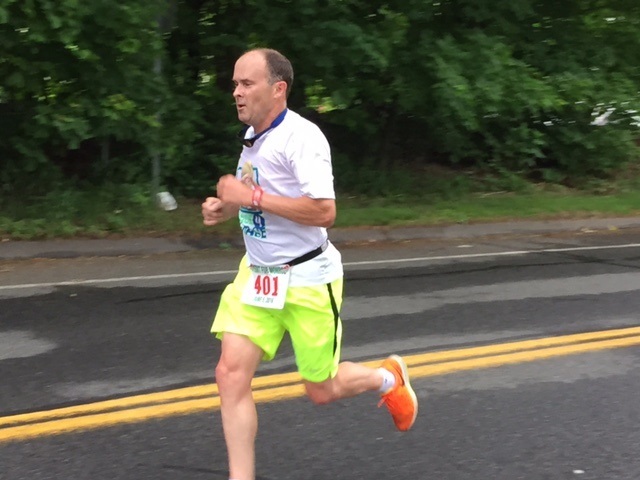 CMAK has applied for charity bibs again this year for the 2017 Boston Marathon and we await notice on the amount of bibs that we secure from the John Hancock Non-Profit Program. We will then open an application process for anyone who would like to be considered for the bib(s). We will also encourage any qualified marathoners to join the team and support the cause. Last year, the team consisted of seven runners and we hope to exceed this number for 2017. If you are interested in participating, email Kevin Grimes at kgrimes@chasekowalskifund.com to get on our list. More details to follow in later newsletters. Deena Ali's date with the Georgia Sky to Summit 50k trail run in Sky Valley, Georgia is fast approaching. 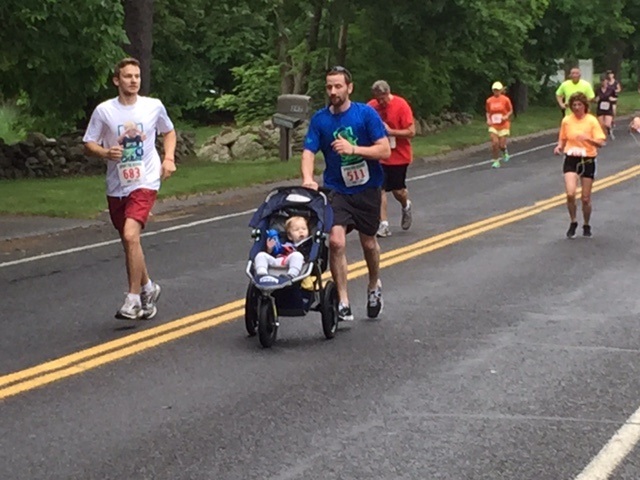 Please support her fundraising efforts as she runs once again in Chase's memory. 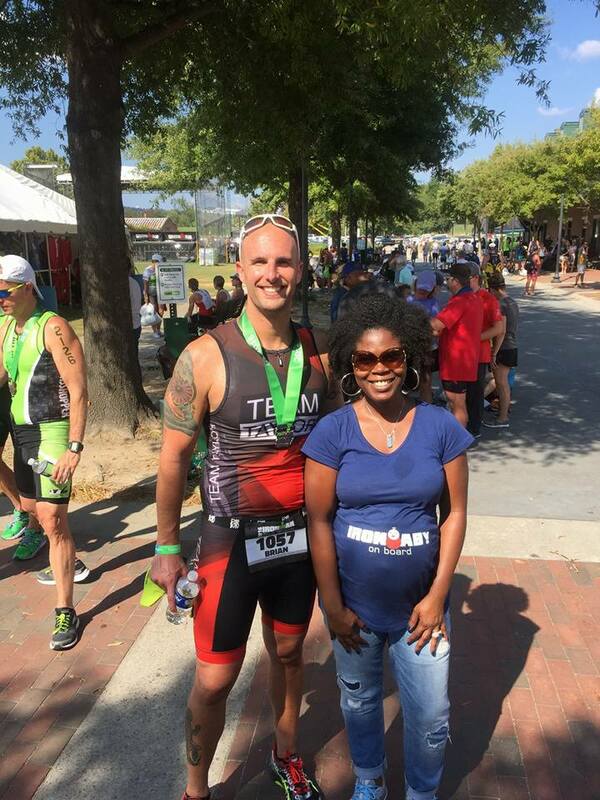 Congratulation to long time CMAK supporter and Race4Chase triathlete, Brian Mora, for setting his PR at the 70.3 distance in the Ironman Augusta 70.3 on September 25th, 2016. 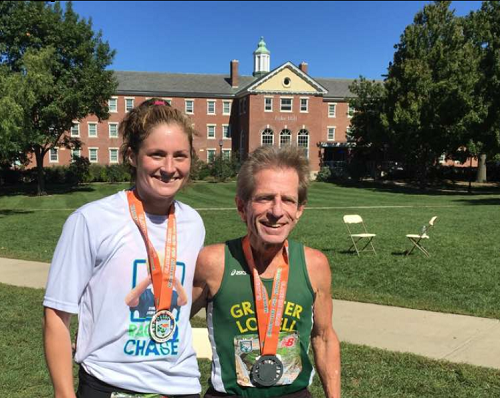 He shattered his best time by over 36 minutes in crossing the line at 5 hours 54 min 10 sec. 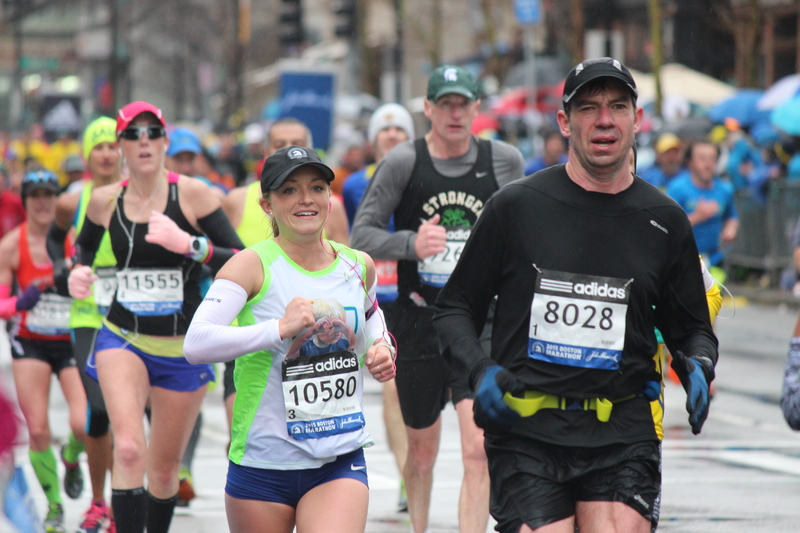 Erin Flanagan completed her fifteenth marathon in her quest to complete a marathon in every state in Chase's memory at the Clarence DeMar Marathon in Keene, New Hampshire. She finish in a time of 3:35, taking 3rd place in her division! At this marathon, she put into circulation the 16th Race4Chase baton by handing it to Tom Peters (pictured above). We await to hear from Tom on his plans for the baton. Baton #15- Jeremy Lawrence of Boulder, CO had to interrupt his plans to conquer the Ironman Louisville with this baton due to injuries sustained in a biking accident this summer. This is the second delay in completing his first Full Ironman distance, but he is determined to make it a reality. The good news is that the delay gives him an opportunity to attempt the Ironman Boulder in 2017, which was his first desire. In the meantime, he will run a Marathon next month in Chase's memory and continue his training for Boulder. Trystan Barnett has held the baton after a transfer from MacKenzie Bloxham in the UK. Trystan is 14 years old and attends Northampton School for boys. He has always been a keen sportsman, running and playing football. 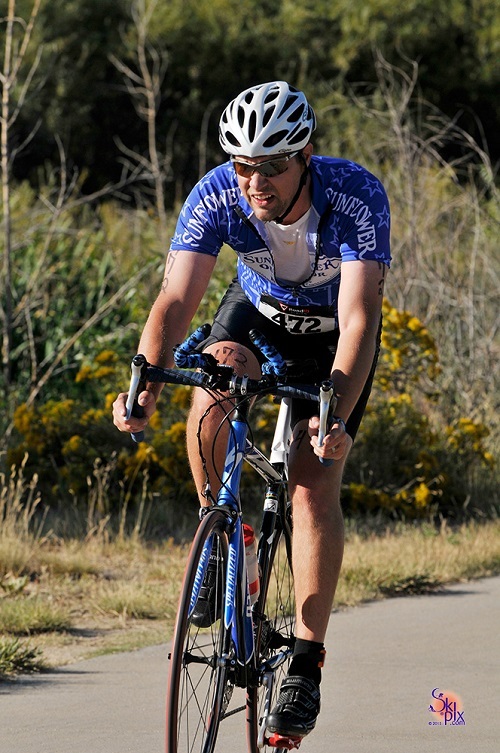 However, in 2012, he decided that he would like to try triathlons. He has enjoyed competing every year since at local level and now at regional level, representing East Midlands. Since then, he has been working on all disciplines, cross country and road running races, duathlons, and this year enlisting the aid of a swim coach. 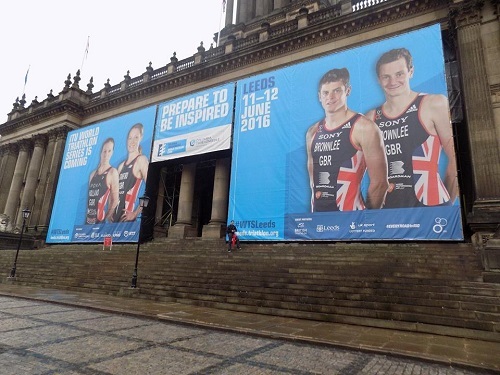 On the weekend of 12th June, it was the ITU event at Leeds. Trystan had the opportunity to compete in the Tristar 3 event. This was a 300m open water swim, 4700m bike and a 2500m run. At the same location was the ITU WTS aquathlon and triathlon events. The event preceding Trystan's was the British Junior championships. 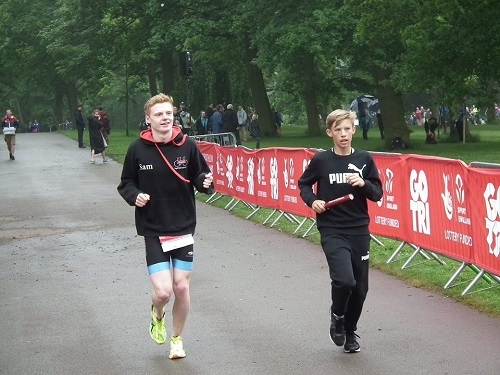 So, as part of Trystan's warm up, we arranged for him to accompany Sam Dickinson, who sealed victory in the aquathlon. During this time, the transfer of the baton happened. 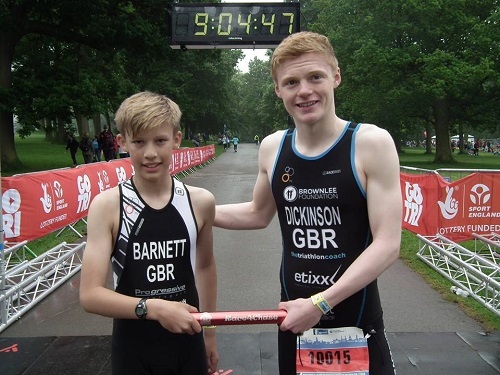 Sam Dickinson took the baton to a follow up event in Europe where he won the Kitzbuhel ETU Triathlon Junior European Cup. We await news from Sam on his plans for the baton.